A person who feels threatened is naturally suspicious of everything and everyone. Because of this, every move is a potential danger – yielding a defensive reaction. To avoid loosing his touch with reality, such a person, must have iron nerves and a sharp eye, so that he can separate what is threatening from what is not. Otherwise, his reactions would only make the situation worse and more dangerous. The reality is that the Islamic Republic feels threatened by the outside world. Particularly, it believes that the United States of America is devising undercover conspiracies to manipulate internal social dissent to topple the regime. Such a viewpoint makes the country’s political and security agencies suspicious of any political or professional action, or any protest whatsoever, and catapults them to confront such events. It is not clear what kind of specific changes the United States is pursuing inside Iran, but a look at media reports from the United States and Europe shows that the feeling of Iranian officials is not unfounded and without basis. Who knows, perhaps the United States has in fact drawn up plans to overthrow the regime. This presents a very awkward situation for dissidents of the Islamic Republic who are pursing peaceful change, and who shy away from overthrowing the regime. They have to endure all kinds of pressure. 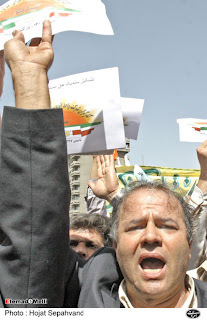 Currently, some factions in the government view all dissidents and critics as parts of America’s secret plan for a “velvet revolution” in Iran (a term denoting non-violent change of the type that took place in some Eastern European countries). Unfortunately, a significant part of the security and intelligence apparatus shares this view. It is not clear to me whether the government’s behavior toward peaceful activists is a reaction to the threat from the United States, or just an excuse to further limit the little breathing space that the government’s critics have. For example, the measures to prevent the Nehzate Azadi (Iran Liberation Movement) from commemoring its anniversary was clearly nothing more than a gathering of political figures with the usual speeches and talks. This event cannot be viewed as a threat from the US because neither the leaders of the movement nor the Americans have shown any interest in each other for such cooperation. But the government’s disruption of the event does show its intolerance of simple and peaceful protests. Should outside pressures on Iran increase, I would not be surprised if this tolerance reaches zero levels. What must be done under the current conditions? Should peaceful activists abandon their limited political and cultural work until tensions between the United States and Iran are resolved? Or should they use all of their ability to resist the pressures of the government, regardless of the costs that would follow? I do not think that either of these options would be suitable for Iran’s situation today. Hence one must look for a third way – if there is one! In my opinion, there is nothing wrong if peaceful activists clearly explain to the government that they are neither after toppling it nor are they cooperating with foreigners, but are merely pursuing the rights recognized by divine, natural, international and domestic laws. If the government’s recent arrest of peaceful activists emanates from a fear of America’s plans, such an explanation can help decrease tensions and a complete suffocation of the breathing space. If, however, factions in the government confront peaceful activists not because of security fears, but because of political bias and the desire to have absolute power, then no one can stop them from continuing on the path that they have embarked on. 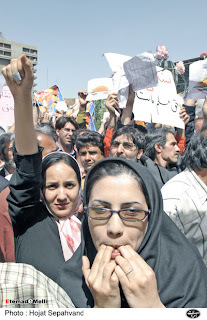 Suppressing peaceful activists has no result other than placing the Iranian government at the helm of human rights violators in the world and helping mobilize civil and intellectual groups on the international stage against the government, thus paving the way for any kind of confrontation that the United States or its allies choose to pursue with Iran. Thus, it is in the regime’s interest to control some of its radical internal factions and institute a tolerant relationship between itself and its peaceful opponents. Such a strategy not only does not threaten the regime’s survival, but also reduces foreign threats. Mr. Mansur Osanlu president of the Syndicate Bus Drivers ( Sherkate Wahed ) have been sentenced to five years in prison by division # 14 of Tehran Court of Revolution. The judge of division # 14 after looking into the file, has sentenced this labour activist to four years in prison for " Activity against national security " and one year in prison for " Propagating against the establisment", In total Mr. Osanlu must spend five years of his life in prison. Link to this news in Farsi "
Requesting from the world human rights communities regarding the 75 milion dollars budget by the USLouise ArbourThe High Commissioner for Human RightsThe Office of the High Commissioner for Human RightsThe United NationsIrene KhanSecretary GeneralAmnesty InternationalKenneth RothExecutive DirectorHuman Rights WatchPaul EnglishExecutive DirectorPrison Reform InternationalExecutive DirectorReporters without BordersChristina M. StormPresidentLawyers without BordersNorman L. ReimerExecutive DirectorNational Association of Criminal Defense LawyersMichel TaubeLe President Ensemble Contre la Peine de MortMichel ForstSecrétaire Général-CNCDHGabriel MouescaPresident of observatoire international des prisons(OIP)May 18, 2007Dear Colleagues and Human Rights Activists,We are all sensitive to violations of human rights by governments and consider it our duty to react to these violations even if in countries such as Iran these reactions have costs. 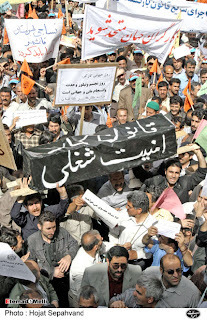 At the same time, we are expected not to be indifferent to new kinds of human rights violations or outright endangerment of human rights activists.In recent years, the government of the United States has announced that it has allocated a yearly budget for the support of civil society, democracy, and human rights in Iran. This so-called “democracy fund” is approved by the United States Congress and extensive media coverage of this financial endeavor has been encouraged.Given the existence of longstanding hostilities between the governments of Iran and the United States, the government of Iran has shown extreme sensitivity to the idea of individuals or groups receiving funds to engage in activities that, in the public words of at least some American officials, is intended for an eventual “regime change” in Iran. I am sure the United States government would show similar sensitivity if it was revealed that there were individuals or organizations in the United States that were receiving funds from hostile groups or countries intent on creating instability in that country.The allocation of yearly funds has led to the Iranian government’s widespread concern and suspicion towards civil society organizations and human rights activists, clearly exacerbating in significant ways pressures on them and the number of arrests. Undoubtedly, not all these pressures and arrests are reflective of recently developed government concerns and suspicions. Forces that are against liberty also use the U.S. budget allocation as a pretext or excuse to legitimize their opposition to civil liberties and to discredit their critics.In such an atmosphere, individuals and organizations that are more active and well-known are easier to spot and hence easier to threaten. In the past two years, we have been witness to numerous accusations hurled against civil society institutions such as the Society for Defending Prisoner’s Rights. Such organizations have also faced investigation and even closure of their offices. In the past 14 months, for instance, I have been summoned by the Iranian judiciary or intelligence organizations 7 times but have not publicized the matter in order to avoid political tensions. I think it time to change course and act in different ways.I would like to state categorically that it is neither wise nor morally justifiable for the United States to continue its path, without due respect or concern for the specific harm and harassment the so-called democracy fund entails for human rights activists in Iran. It is not right for independent individuals and institutions inside Iran to pay the price for allocated funds that the United States government spends on broadcasting from the United States into Iran or for the activities of exiled Iranian groups that cooperate with various American organizations.This is why I hereby make a plea to you and your respected organizations to insist that the United States government change its ways or, in case of its insistence on allocating a yearly budget, make public and transparent the exact amount and recipients (individuals and groups) of these funds. In this way, problems are reduced for independent democracy and human rights activists in Iran. In addition, the United States government can no longer be accused of, willingly or unwillingly, being complicit with the suppressive forces in Iran which have been using the so-called democracy fund as an excuse to harass civil society activists.I thank you in advance for your careful attention to this urgent matter and hope that the necessary steps are taken as soon as possible to correct the wrong approach taken by the government of the United States and to promote transparency. Violation on"Iranian people's human rights" under Islamic Republic continues and the people's patience one day will lead to : " all out Iranian cry for freedom and respect for Human rights " on the street's in Iran . I havn't been able to update my blog time to time because of heavy journalism class assignment. We are 32 students from many countries around the world and our program is called: Canadian Journalism for Internationally Trained Writers. Tomorrow i have one exam and one assignment on Globalization : Wonderland or Wasteland . All of this will end on Agust this year, i hope, and IRAN WATCH CANADA will continue to monitor Islamic Republic of Iran on violation of human rights.IRAN WATCH CANADA is the voice of the voiceless Iranian. Iranians "critical to Islamic Republic" living abroad are being arrested when visiting their sick parent back in Iran. Watch this video. allowed to have a lawyer. retained, preventing her from leaving Iran. judge in the case has demanded bail of 400 million tounen (320,000 euros). list of predators of press freedom. They call it: Islamic Human Rights code and women call it barbaric code! Despite of being beaten or jailed but women in Iran continue their fight for their human rights . A successful campaign spearheaded by IPA has led to the reunification of the 20th Tehran International Book Fair. The Iranian authorities had initially threatened to segregate domestic and international publishers. IPA welcomes the cancellation of the separation plans of the 20th Tehran International Book Fair (TIBF; 2-12 May 2007) by the Iranian authorities. After receiving news of the Iranian authorities' intentions to separate the international publishers from the domestic publishers on the occasion of the 20th TIBF, IPA had raised its deepest concerns with the Iranian Minister of Culture and Islamic Guidance in March 2007. On the occasion of a meeting with an official from the Ministry of Culture and Islamic Guidance in late March in Paris, the Iranian authorities had confirmed it was their intention to proceed with the segregation plan, allegedly due to decaying exhibition buildings as the main reason for separating domestic and international publishers. IPA made it clear that such an argument was not acceptable, adding that international publishers would see no point in participating in a segregated book fair as exchange with our Iranian colleagues would be hindered. Ana Maria Cabanellas, IPA President, declares: "We are satisfied with the Iranian authorities' decision to cancel the separation plans of the 20th TIBF. Our trade is based on the free exchange that exists between local and international publishers. A book fair where obstacles are raised between domestic and international publishers ceases to be a book fair. We therefore hail the unity of the Tehran book fair and hope this unity will be long-lasting". IPA currently has 65 member associations in 53 countries. 35 students of Zanjan University have been summoned to the disciplinary committee of the university! According to Mr. Navid Nurifar spokesperson for the Association of Islamic Student in Zanjan University some of these people are active member of the central council of the student association. Some of these people today and others tomorrow will appear before the committee and will receive their suspention from continuing their study for one or two semester. 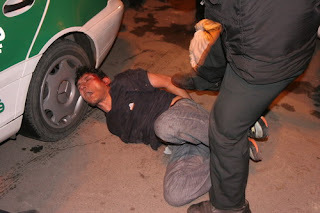 IRAN WATCH CANADA: These are the tactics of the Islamic Republic against student activists . 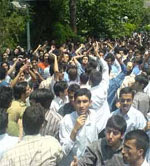 They continue harrassing students , banning students from enrolement , expelling students from university , summoning students to disciplinary committee, calling students parents and scaring them , closing student publications ...........but despite of all kind of harrassment the students struggle for "democracy and human rights" continue and steadily growing in Iran. A journalist have been detained because of his critical article on right wing Islamists ("Osulgarayan ")! Mr. Karamolah Mohammadikhah wrote and article with the title : " opportunism and losing opportunity among right wing" in " Asre Roshangari" publication in the city of Yasuj was arrested on last Sunday and at present he is spending time in the central jail of the city. 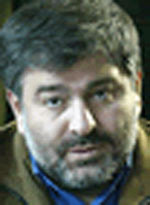 According to ILNA: His article brought anger among right wings (" Osulgarayan"). Mr. Mohammadikhah is member of the council for research on education for the city of Yasuj. 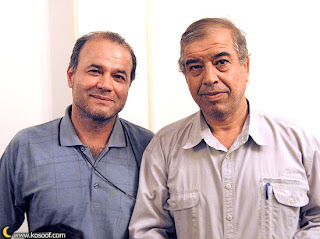 Mr. Mohammadikhah who in the past was a member of right wing (Osulgarayan) but later separated, with this article critically looked at their problems and also had offerd a proposal for their unity which angered many right wingers ( Osulgarayan) and apparently their complaint against him. According to "Asre Roshangari " publication he is charged with: "publication of lies" and " Creating public unrest". He was supposed to be released on bail but his surety was not accepted and therefore he is currently in prison. Manager of Persian blog is detained! Mr. Mehdi Botorabi the manager of Persian blog is detained since last week based on conflicting charges. 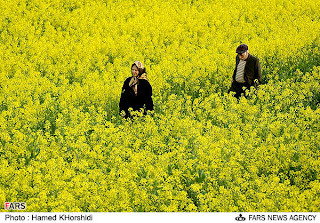 It was Ms. Fakhrosadat Mohtashamipoor ( The women's issue conunsel for the ministry of Interior during Khatami's presidency) who for the first time in her blog reported of Mr. Botorabi's imprisonment. No body knows why he is been detained? His wife , childeren and mother are worried about his health and no body says anything from judiciary . 40 students have been summoned ! 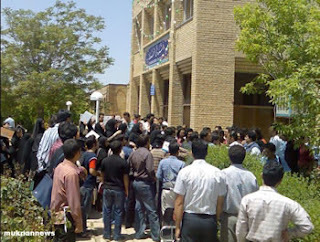 40 students from Amirkabir University are summoned to disciplinary committee! According to ILNA; past central council member of Amirkabir Association of Islamic Students Mr. Mostafa Ghafuri have said: More than 40 students have been summoned to the disciplinary committee.Mr. Ghafuri said : these students were charged with speaking in a free public tribune and participation in the gathering. According to this report Mr. Ali Saberi chair of the students of Amirkabir University was banned for enrolement and therefore is deprived continuing his education for a semester. Mr. Saberi said : Today after attending the school i was told by phone that ishould stay out of classes for a semester. I was supposed to graduate this semester but because of this situation i have to waite for another semester. They also called my father and told him to ask me to go back home in the city of Mashhad and if this is not done ; i'll be expelled from university. IRAN WATCH CANADA: Freedom of expression , Freedom of press, Freedom to social and political gathering and speaking in public forum are all students human rights.Islamic republic must respect these rights. Name of some of the teachers arrested on Tuesday May 8 gathering infront of parliament in "Baharestan" square. According to "Advar" news: Following the gathering of teachers on Tuesday May 8,07 infront of parliament and clashes between police and teachers at least 22 teachers have been reported arrested and detained. 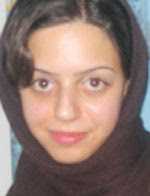 Witnesses have told Ms. Mirezaie a teacher from Tehran have been beaten by the security forces. 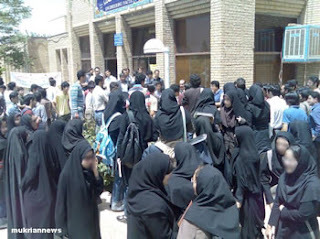 Student at "Razi" technical and Engineering college in the city of Kermanshah protest against deputy of "Herasat " ( a branch of Ministry of Information in universities and government offices ) who have raped a woman student. Respect for human rights or violation of human rights , which one Islamic Republic of Iran intend to follow? In recent weeks once again Tehran public prosecutor, Judge Said Mortazavi resurfaced and this seems of regrouping and a new begining for the forces who have stood against any social,cultural and economical developement in our country Iran since the revolution . Iranian people ask themselves who are these people ? Why they are against civil liberties, human rights, freedom of expression and press in Iran? who are these people really? Who are backing them up? 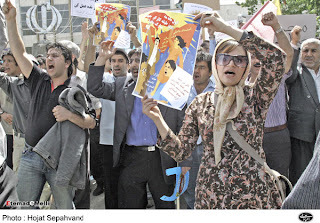 They are Iranian but are against Iran's modernization and developement. and ..... . They are after their human rights. They are tired of witnessing Ahmadinejads government violating their human rights.The Islamic Republic has no other choice but to respect their rights or else face the rising protests.There is no other way out. 15 MP's demanded from "Ministry of Guidance and Culture" to stop puting pressure, threat and restriction against some of the print and online media including Iran's Labour News Agency ( ILNA) ! 15 members of the parliament in a notification which was red by parliamentary speaker have demanded Mr. Safar Harandi the Minister of Guidance and Culture to follow article 9 and 24 of the constitution and article 4 of the press law . In their notification to minister they have said:According to documents and evidence your ministry has put pressure, restriction and threat on print and electronic media based on false pretexts and have forced them to censor events and incidents and as well has deprived them from facilities. At the end they demanded the minister to remove all restriction from media. 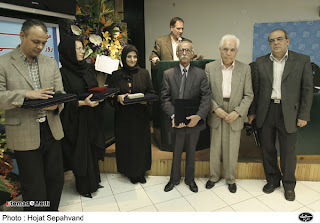 Honouring best five journalists of the year in Iran by the Association of Iranian Journalists. Mr. Abbas Abdi, Ahmad Reza Daryaei, Mr. Firuz Guran,Mr. Abdolali Rezaei and Ms. Shahla Sherkat are the best five Iranian journalists of the year. In 1998, Tara Singh Hayer, an immigrant journalist born in India, was killed in the garage of his British Columbia home. Almost a decade later, his murder remains unsolved. It's a Canadian example of the killing of a journalist with impunity, the theme of this year's World Press Freedom Day, May 3. More than 80 journalists were killed in 2006. Canadian Journalists for Free Expression (CJFE) Executive Director Anne Game says, "the added tragedy is that in almost all of these cases, the killers and the masterminds behind the killings continue to walk free." Statistics show that in 85 per cent of these cases no one will be held to account. Impunity within a country has a domino effect, she said, encouraging others to commit crimes, knowing that they will also go unpunished. After holding the first protest rally against the military government in Pakistan, Zahir Babur was threatened by the country's secret services. "They didn't like my work as a journalist and union leader and wanted to shut me up because I was working for human rights," said Babur, an exiled journalist living in Canada since 2002 . When the Lahore Press Club building was raided by police in 2000, Babur was General Secretary of the largest journalist group in the country. Babur worked for the Urdu Daily Pakistan and Recorder but left Pakistan when he grew tired of warnings about his work from the Secret Service and police. "I was warned not to lead the press club, an organization of more than 900 journalists," added Babur. 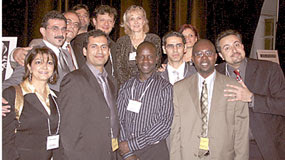 Nine journalists who worked for the Daily Pakistan now live in exile in Canada. World Press Freedom Day honours journalists who brave death or jail in pursuit of the truth. In a recent report released by the Paris-based International News Safety Institute (INSI), the number of journalists killed in line of duty has escalated dramatically in recent years. In the past decade, more than a thousand media members have been slain, and in nine out of 10 cases, the perpetrators have never been prosecuted. Reporters Without Borders says that 81 journalists and 32 media assistants were killed last year. It is the highest toll since 1994, when 103 died, half of them in the Rwandan genocide. An additional 1,400 attacks or threats were carried out against journalists - many of them during election campaigns in Latin America, Africa and Eastern Europe. "We are watching the situation of immigrant journalists in Canada and will do our best to support the journalists living in Canada," said Emily Jacquard, Secretary General of the Canadian Section of Reporters Without Borders. Many cases of the murders of journalists are never resolved, the sense of impunity only encourages more killings, advocates say. There is also little public sympathy for these cases. "In countries such as Iran, Cuba or Pakistan, you cannot criticize the supreme leader, question the country's policies or even the economic corruption among the power-holders," notes Maryam Aghvami, an Iranian journalist who is now living in Toronto. "If you are brave enough to do so, you are accused of acting against the country's national security, spreading lies and spying for Western powers," added Aghvami. While there is no meaningful global data comparing journalists killed on the job with, for example, firefighters, Julie Payne, CJFE's program manager, says the consequences are more profound. The killing of a journalist undermines one of the primary means of holding people accountable - and serves to silence others. Today, Canada has become the mecca for exiled journalists.The irony is that many journalists living in exile in Canada have been muzzled again in a land that prides itself on freedom of speech. They are struggling very hard to reach Canadian newsrooms.They have launched their own online magazine at www.jexcanada.com - to create a place to be heard. After coming to Canada Zahir Babur completed a two-year broadcast journalism program but never found a job in a newsroom. He worked as security guard. A few exiles are looking towards internships at media outlets this fall as part of their classes at the Sheridan College journalism program. "These journalists in exile have paid a very high price for their commitment to press freedom. But these journalists will be working once again, doing what they do best - writing, photographing, recording and reporting, and exercising your right to freedom of expression," said Payne. "May Day" is a day of workers rights day. On this day they let everybody know of their situation. It is a good day for both the workers and the government. May Day rally in Iran. 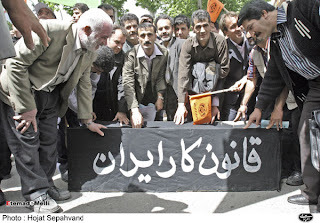 Workers carried the coffin of "labour law in Iran" and " Job security" ! Just because she has make up and a few of her hair could be seen or she diden't follow the dress code. Look at the people: How fast they come together to let free the young girl . In this picture Mr. Osanlou is on the left. On Tuesday( May first) the International workers day Mr. Osanlou the president of Tehran Bus Workers Union have been arrested again. He was arrested on the morning of Tuesday by 15 agents from the Ministry of Information in " Hafte Tir " Subway Station while on his way joining the May Day rally in "Shirudi" stadium. At the time of his arrest many people were present and tried to stop the agents and set him free but were unable. "ILNA" : We will continue to write what the people say! The government of president Ahmadinejad has banned reporters from "ILNA" ( Iran's Labour News Agency) for covering president's news programs. Now that the government won't let us to write what the president says, we will continue to write what the people say!